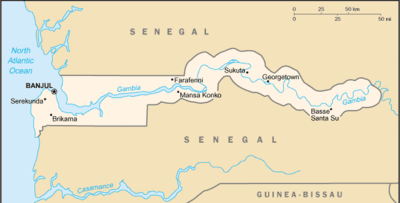 The Gambia, officially the Republic of The Gambia, is a country in Western Africa. It is the smallest country on the African continental mainland and is bordered to the north, east, and south by Senegal, and has a small coast on the Atlantic Ocean in the west. The River Gambia flows through the centre of the country and empties into the Atlantic Ocean. On 18 February 1965, The Gambia became independent from the British Empire. 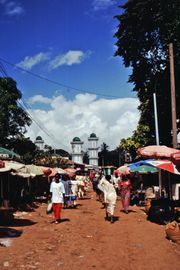 Banjul is its capital. The first written accounts of the region come from records of Arab traders in the ninth and tenth centuries AD. In 1066, the inhabitants of Tekrur, a kingdom centered on the Sénégal River just to the north, became the first people in the region to convert to Islam. Muslim traders established the trans-Saharan trade route for slaves, gold, and ivory. At the beginning of the fourteenth century, most of what is today called The Gambia was a tributary to the Mali Empire. The Portuguese reached the area by sea in the mid-fifteenth century and began to dominate the lucrative trade. In 1588, the claimant to the Portuguese throne, António, Prior of Crato, sold exclusive trade rights on the Gambia River to English merchants; this grant was confirmed by letters patent from Queen Elizabeth I. In 1618, James I granted a charter to a British company for trade with Gambia and the Gold Coast (now Ghana). Between 1651 and 1661, part of Gambia was (indirectly) a colony of the Polish-Lithuanian Commonwealth; it was purchased by the Courlandish prince Jakub Kettler. At that time Courland, in present-day Latvia, was a fiefdom of the Polish-Lithuanian Commonwealth. The Courlanders settled on James Island, which they called St. Andrews Island, and used it as a trade base from 1651 until it was captured by the English in 1661. 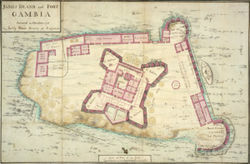 A map of James Island and Fort Gambia. During the late seventeenth century and throughout the eighteenth, England and France struggled continually for political and commercial supremacy in the regions of the Senegal and Gambia rivers. The 1783 Treaty of Versailles gave Great Britain possession of the Gambia river, but the French retained a tiny enclave at Albreda on its north bank, which was ceded to the United Kingdom in 1857. As many as three million slaves may have been taken from the region during the three centuries of the transatlantic slave trade. In 1807, slave trading was abolished throughout the British Empire, and the British tried unsuccessfully to end the practice in Gambia. They established the military post of Bathurst (now Banjul) in 1816. In the ensuing years, Banjul was at times under the jurisdiction of the British governor-general in Sierra Leone. In 1888, Gambia became a separate colonial entity. In 1889, it became a crown colony. An 1880 stamp from Gambia. Until a military coup in July 1994, The Gambia was led by President Sir Dawda Kairaba Jawara, who was re-elected five times. The relative stability of the Jawara era was first broken by a violent, unsuccessful coup attempt in 1981. Arch 22 monument, a memorial of the 1994 coup. In July 1994, the Armed Forces Provisional Ruling Council (AFPRC) seized power in a military coup d'état, deposing the government of Sir Dawda Jawara. Lieutenant Yahya A.J.J. Jammeh, chairman of the AFPRC, became head of state. The AFPRC announced a transition plan for return to democratic civilian government. The Provisional Independent Electoral Commission (PIEC) was established in 1996 to conduct national elections. The PIEC was transformed to the Independent Electoral Commission (IEC) in 1997 and became responsible for registration of voters and conduct of elections and referenda. In late 2001 and early 2002, The Gambia completed a full cycle of presidential, legislative, and local elections, which foreign observers deemed free, fair, and transparent, albeit with some shortcomings. President Yahya Jammeh, who was re-elected, took the oath of office again on December 21, 2001. The APRC maintained its strong majority in the National Assembly, particularly after the main opposition United Democratic Party (UDP) boycotted the legislative elections. A presidential election took place in September 1996, in which retired Col. Yahya A.J.J. Jammeh won 56% of the vote. Four registered opposition parties participated in the October 18, 2001, presidential election, which the incumbent, President Jammeh, won with almost 53% of the votes. The APRC maintained its strong majority in the National Assembly in legislative elections held in January 2002, particularly after the main opposition United Democratic Party (UDP) boycotted the legislative elections. On the 21st and 22nd of March 2006, amid tensions preceding the 2006 presidential elections, an alleged planned military coup was uncovered. President Yahya Jammeh was forced to return from a trip to Mauritania, many suspected army officials were arrested, and prominent army officials, including the army chief of staff, fled the country. There are claims circulating that this whole event was fabricated by the President incumbent for his own purposes; however, the veracity of these claims is not known, as no corroborating evidence has yet been brought forward. The 1970 constitution, which divided the government into independent executive, legislative, and judicial branches, was suspended after the 1994 military coup. As part of the transition process, the AFPRC established the Constitution Review Commission (CRC) through decree in March 1995. In accordance with the timetable for the transition to a democratically elected government, the commission drafted a new constitution for The Gambia, which was approved by referendum in August 1996. The constitution provides for a strong presidential government, a unicameral legislature, an independent judiciary, and the protection of human rights. 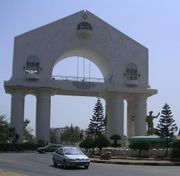 Banjul, the national capital, is classified as a "city". The divisions are further subdivided into thirty-seven districts. Of these, Kombo Saint Mary (which shares Brikama as a capital with the Western division) may have been administratively merged with the greater Banjul area. The Gambia is a very small and narrow country whose borders mirror the meandering Gambia River. The country is less than 48 km wide, with a total area of 11,300 km². Its present boundaries were defined in 1889 after an agreement between the United Kingdom and France. It is almost an enclave of Senegal and the smallest country on the continent of Africa. Agriculture accounts for 29% of gross domestic product (GDP) and employs 75% of the labour force. Within agriculture, peanut production accounts for 6.9% of GDP, other crops 8.3%, livestock 5.3%, fishing 1.8%, and forestry 0.5%. Industry accounts for 12% of GDP. Manufacturing, which accounts for 5.5% of GDP, is primarily agriculturally based (e.g., peanut processing, bakeries, a brewery, and a tannery). Other manufacturing activities include soap, soft drinks, and clothing. Services account for 19% of GDP. The UK and other EU countries constitute The Gambia's major domestic export markets, accounting for 86% in total; followed by Asia at 14%; and the African subregion, including Senegal, Guinea-Bissau, and Ghana at 8%. The UK and the other EU countries (Germany, France, Netherlands, Belgium) were the major source of imports, at 60% of the total share of imports, followed by Asia at 23%, and Cote d'Ivoire and other African countries at 17%. The Gambia reports 11% of its exports going to and 14.6% of its imports coming from the United States. A wide variety of ethnic groups live in The Gambia with a minimum of intertribal friction, each preserving its own language and traditions. The Mandinka tribe is the largest, followed by the Fula, Wolof, Jola, and Serahule. The approximately 3,500 non-African residents include Europeans and families of Lebanese origin (roughly 0.23% of the total population). The Gambia was the first and last British colony in West Africa. In his 1977 Pulitzer Prize-winning book Roots: The Saga of an American Family, Alex Haley traced his family back to Kunta Kinte, enslaved from the village of Juffure in the north bank of The Gambia. En route to Casablanca for a conference and then to Liberia, U.S. President Franklin D. Roosevelt became the first serving U.S. president to visit the African continent when he stopped in Banjul in 1943. In the 1930s, The Gambia was a transit point for the German airline Lufthansa's transatlantic mail service. Three aircraft were lost during this period . Yundum Airport was an emergency landing site for NASA space shuttles.